This beautiful ensemble can be very hard to find. Even the Rose colored closed toe heels are hard to find. 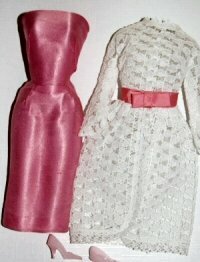 The delicate white lace overdress can easily show wear - and be extra careful when putting it in your vintage Barbie. Her thumbs and fingers are prone to stick through the lace and can easily cause a tear.